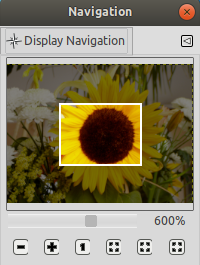 The Navigation dialog is designed to offer easy movement around the active image if the zoom is set higher than what the image window can display. If this is the case, there is an inversely colored rectangle that shows the location of the current view area in respect to the image. Click and drag the rectangular area. Use Shift and mouse-wheel to move horizontally, Alt and mouse-wheel to move vertically. The mouse pointer must be on the rectangular area in the shape of a grabbing hand. The “Navigation” dialog is a dockable dialog; see the section Paragraaf 2.3, “Koppelen van dialoogvensters” for help on manipulating it. from the image-menu: View → Navigation window. It allows easy zoom level control, more precise than with the Zoom command. This slider can also be moved using the mouse wheel when the mouse pointer is on the slider, or Ctrl and mouse wheel when the mouse pointer is on the rectangular area. Zoom Out Zoom In and Zoom 1:1 are self explanatory. The zoom ratio is adjusted so that the whole image becomes visible in the window as it is. The image size and the zoom are adjusted so that the image is fully displayed with the lesser zoom. Restore the image window to the size which allows the image to be fully displayed with the zoom unchanged. This command is also as menu entry available. See Paragraaf 5.6, “Shrink Wrap” for the details.